Stockholm is one of Europe’s fastest growing cities and one of the best to live and work in. Many large multinational companies have headquarters in the Stockholm region as it is the business and finance hub of northern Europe. The city is famed for its diversity and the warmth of welcome on offer and is known as a pioneer in the music, technology and creative industries. Stockholm is one of the fastest growing cities in Europe. The largest tourist destination in Scandinavia, one of Europe’s top 15 destinations with 13.5 million commercial overnight stays in 2016. The strongest, most stable and transparent growing economy in Scandinavia, with a high GDP per capita. Stockholm has the 7th highest GDP per capita out of the 273 regions in Europe. The business hub of Northern Europe, ranked the 10th metropolitan region in the world with the most global headquarters on Forbes Global 2000 list. Most Unicorn companies per capita in the world after Silicon Valley – Business sector with strong international character, 20% of all employees in Stockholm County work for foreign-owned companies. Stockholm has an international community with 32% of the population having a foreign background. 1.3 million inhabitants in the catchment area (32%) are born or have parents born abroad. New Destination Discount (NDD) with generous discounts on take-off and passenger charges during the first three years. Applies to unserved destinations. Passenger Increase Bonus (PIB) which gives airlines a 40% payback on passenger charges on incremental volumes. Marketing Support (MGS) granted for new routes or frequency increases. Additional support in relation to route inauguration. Support from local partners such as Visit Stockholm, Invest in Stockholm, Visit Sweden. 90-minute catchment (by road): 3.0 million people. 180-minute catchment (by road): 3.85 million people. Good balance between exports (55%) and imports (45%). The largest export market is Shanghai and a direct flight would be welcomed by the cargo community. Demand for higher quality of pharmaceutical shipments is increasing and cargo handling company, Spirit Air Cargo Handling, CEIV will be certified by the end of this year. Swedavia forecasts an increase in imports related to e-commerce. In July this year, the incoming air mail volume from China increased by 60%. Stockholm Arlanda Airport is located approximately 42 kilometres (25 miles) north of the centre of Stockholm and approximately 36 kilometres from the centre of Uppsala, just off the E4 motorway. The public transportation system to the airport is extensive from the surrounding areas offering a large bus network, commuter, regional and long-distance trains. Commuter trains to Stockholm depart twice an hour to/from Arlanda Central Station in Sky City. Total travel time between the airport and Stockholm Central Station is 43 minutes. The Arlanda Express train operates to Stockholm city centre, departing every 15 minutes for most of the day. Travel time: 20 minutes. Flygbussarna Airport Coaches depart every 10-15 minutes to different areas in Stockholm. Travel time to City Centre: 35-45 minutes. Flygbussarna also offers Door to Gate – a minibus shuttle concept. Taxi services are readily available at Stockholm Arlanda Airport. Travel time between the city of Stockholm and the airport: approx. 40 minutes, depending on time of day. Carsharing: At Arlanda Airport you will find cars from DriveNow and Sunfleet carsharing services. Runways: Three (01L-19R, 10,830 feet; 08-26, 8,202 feet; and 01R-19L, 8,202 feet). Four terminals: T3 and T4 for domestic, T2 for international and T5 for international and intercontinental. Min connection time: 15 minutes on foot or two minutes between T2 and T5 using Arlanda Express. The airport is in the planning and execution process of the Arlanda Development project (UPA) which is due to be completed in 2050. Nearly 27 million passengers will travel to/from Arlanda in 2017, a 10% increase on 2016. 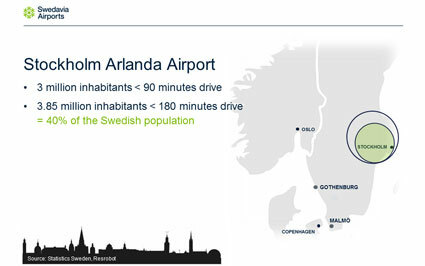 Arlanda is currently the fastest growing capital airport in Scandinavia and it is international leisure traffic that is stimulating growth. Demand for Stockholm and Sweden is increasing and international passengers, who currently account for 40% of all traffic at Arlanda, are growing more than twice as fast as domestic passengers. Arlanda’s importance as a hub is also growing and it now offers 35 intercontinental routes, following the introduction of services to Miami and Eilat by SAS at the end of October 2017. Transfer traffic currently represents 16-17% of all passengers and is continuing to grow. 166,122 tons handled in 2016. 10.6% year-on-year increase experienced for the period from January to June 2017. Largest freight carrier: Korean Air Cargo.